Spring and summer in the Bitterroot! What could be better? Just remember when you are out there enjoying the great outdoors, the tiny tick can be a hefty health hazard. Avoiding tick bites is your best bet when it comes to preventing Rocky Mountain Spotted fever or any other tick-borne disease. Always check yourself, your children and your pets for ticks after spending time in an area likely to have ticks. Ticks like places that are warm and moist, so always check the back of the knees, armpits, groin, scalp, pack of the neck, and behind the ears. 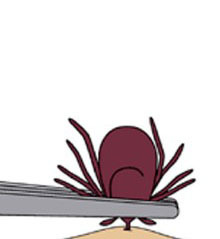 If you find a tick attached to your body, remove it as soon as possible, using fine-point tweezers. Do not squeeze or twist the tick's body, but grasp it close to your skin and pull straight out with steady pressure. After removing the tick, wash the area and your hands well. What about Tick -Borne Diseases? Follow the links below to learn more about each of these tick-borne diseases.